BUDDHA FACE IN POLISHED BRASS WITH MATTED DARK TONED HAIR. THE BUDDHA FACE IS OF THE SIDDHARTHA BUDDHA, THE BUDDHA OF ENLIGHTENMENT (TRADITIONALLY KNOWN AS GAUTAMA BUDDHA). BUY THIS 14 INCHES STATUE FROM OUR ONLINE STORE, BUDDHA BAZAAR, DHARAMSALA, INDIA. 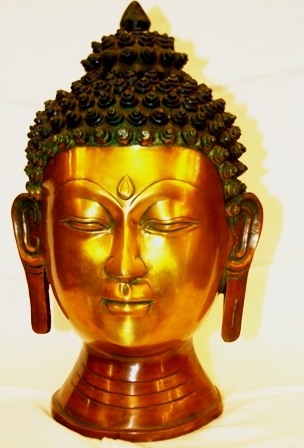 Buy Buddha Face Statue in 14 inches Brass Cast, handcrafted at Buddha Bazaar by our local artists. Height: 14 inches, Length: 8 inches. Like the information on our Buddha Face Brass Statue, visit us here for more information on Buddhism.